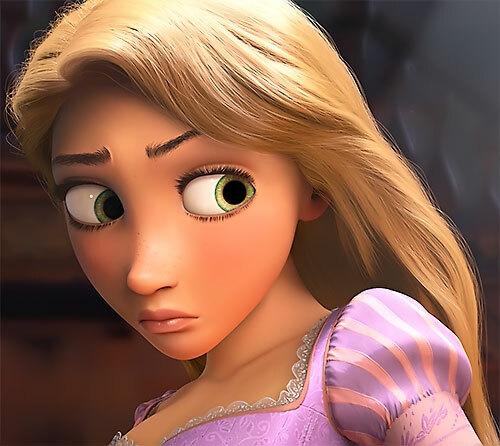 Rapunzel was the 2010 “Disney Princess”, starring in the movie Tangled. She is of course based on ye olde Rapunzel Brothers Grimm folk tale , though not closely. 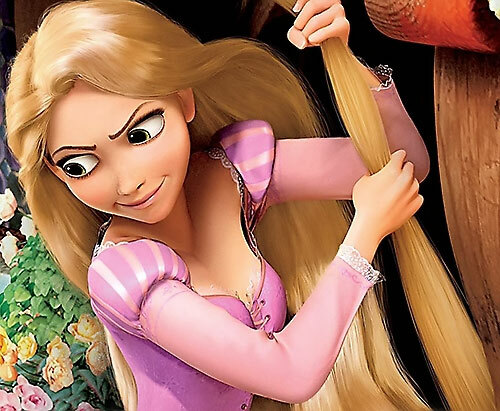 Many of the changes were meant to make this version of Rapunzel a more active character, with agency and personality. Between this and Rapunzel being the first computer-generated Princess, her legendary magical hair essentially become a superpower – not unlike Marvel’s Medusa. My daughter loves this movie and I’m looking at perhaps doing profiles for other Disney princesses. Other Aliases: Flower (By Mother Gothel), Goldie (By Flynn). Known Relatives: Unnamed King (Father), Unnamed Queen (Mother), Adopted Mother (Mother Gothel). Base Of Operations: Hidden tower in the Forest. Height: 5’1” Weight: 95 lbs Age: 18. Eyes: Green Hair: Golden Blond. Other distinguishing features: A spattering of freckles on her nose. 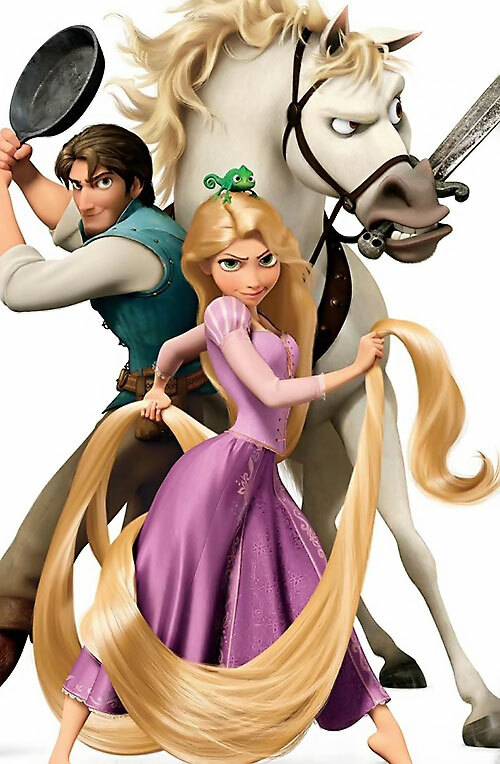 Rapunzel is a spirited teenager with an unusual super power, 70 feet of magical golden hair! She is a talented artist and skilled in an endless variety of creative endeavours. She can cook, dance, sing, perform ventriloquism, play guitar, dance ballet, craft paper maché, do pottery, sew, make candles, paint, and knit. She also plays chess and mentions she had charted the stars. She exercises routinely and is gifted physically. She is incredibly light on her feet and has the strength to pull a 100 pound person from the ground to the window of her tower on a daily basis. 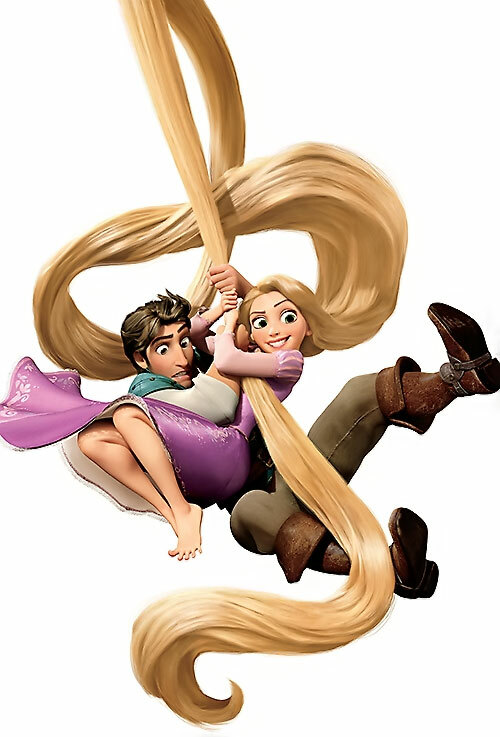 Rapunzel’s magical hair has unusually high tensile strength for bearing loads. It’s hard to break, though it’s light weight and easily cut. It also has a whip-like nature and can be used to grasp objects, even small ones like her pet chameleon’s tail. 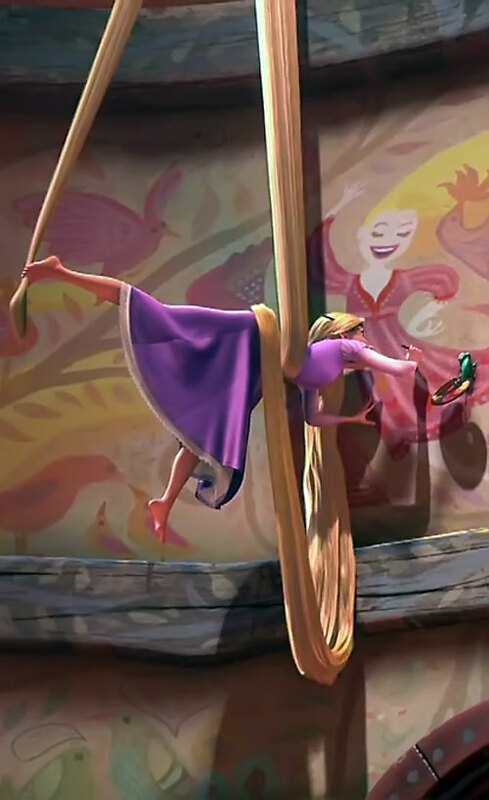 Rapunzel may use her hair as a swing line too. 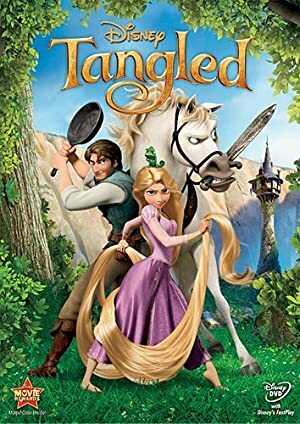 And though the title of this movie is Tangled, her hair isn’t. The daily brushing she does would do little to prevent it. Her hair has further magical healing powers. When the healing song is sung, her hair glows brightly and whomever is holding her hair gains its benefit. It erases aging and heals wounds. 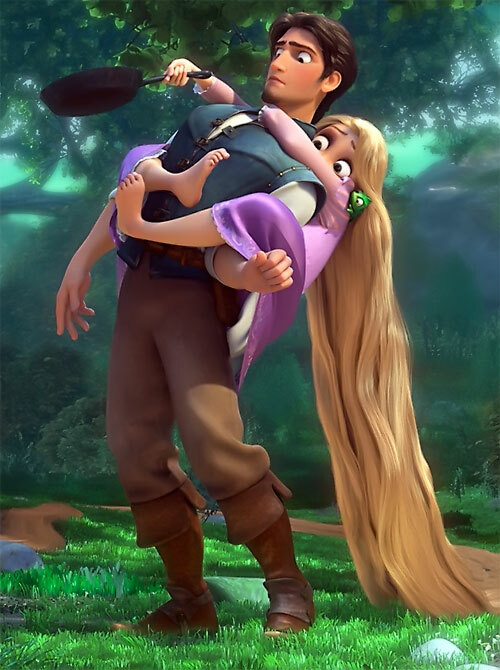 It is likely that the magic in her hair might have kept Rapunzel herself young indefinitely after she reached maturity. 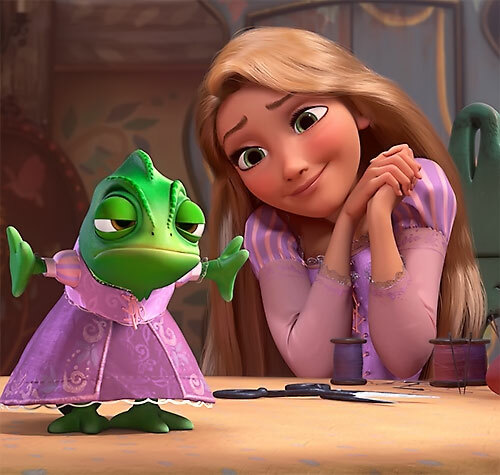 Rapunzel is highly perceptive, playing hide-and-seek with her pet chameleon Pascal often… and always winning. …a single drop of sunlight fell from the heavens and from this small drop of sun, grew a magic golden flower. It had the ability to heal the sick and injured. Centuries passed and a kingdom grew, it was ruled by a beloved King and Queen. The Queen was about to have a baby when she got sick, really sick. She was running out of time, and that’s when people usually start to look for a miracle – or in this case, a magic golden flower. Mother Gothel, hoarded the flower’s powers for herself. She hid it from others and used its powers to keep herself young for hundreds of years. All she had to do was sing a special tune. However, the soldiers found the flower. It was brewed into a potion and fed to the Queen, restoring her to perfect health. Her child was born with long golden hair. Rapunzel was her name. Mother Gothel was so angry at losing her flower, she broke into the Castle. Learning that the child’s hair had the flower’s abilities, she kidnapped her. Mother Gothel raised Rapunzel as her own, keeping her locked away in a tall tower that stood hidden deep within the forest. Each day the child sang the tune that would cause Mother Gothel to remain young. 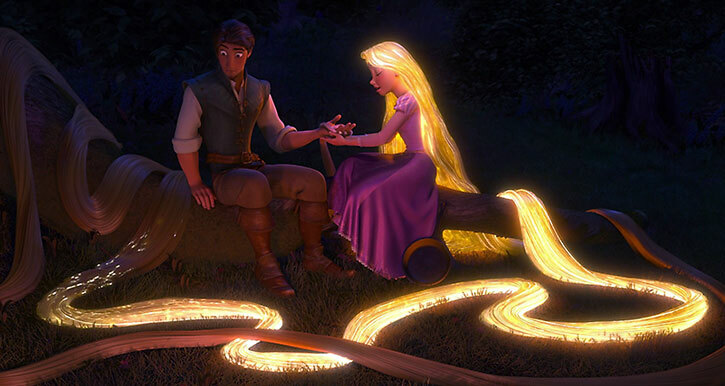 The King and Queen, and even all the people of the kingdom, released lanterns every year on Rapunzel’s birthday. The first was to celebrate her birth… every year since, it was to commemorate the lost princess. Until, as chance would have it, a thief by the name of Flynn Rider stole the lost princess’ tiara from the King. He then hid out in a lonely tower in the woods. It just happened to be Rapunzel’s tower. 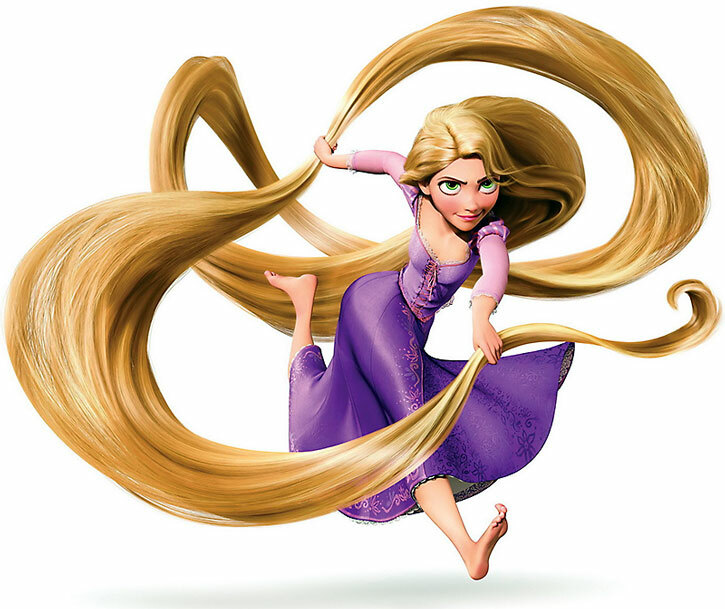 Rapunzel has long hair… long, long hair. She is young with a light, delicate build. She wears an ankle length purple dress and goes barefoot. At one point some children braid up her hair with flowers so that it doesn’t drag the ground. To say the least, Rapunzel had an extremely sheltered childhood. She practically lived out her first 18 years in a small hidden tower. She had only 3 books to read, titled Geology, Cooking, and Botany. She devoured these books on a daily basis. Rapunzel hadn’t even met or seen a human male by this time and thought they were all monstrous fanged creatures. Even though this was her routine it didn’t depress her as she knew nothing else. Rapunzel is an exciting vibrant and outgoing young lady. However, she does show a desire to begin her life. When she’s excited about something she is absolutely bubbly. Thanks to Mother Gothel, Rapunzel believed everyone in the world was dark, selfish, and cruel, out to take advantage of her and her hair’s power. During these years her only human interaction was with her “mother”, Mother Gothel. Verbal abuse by Mother Gothel was common. 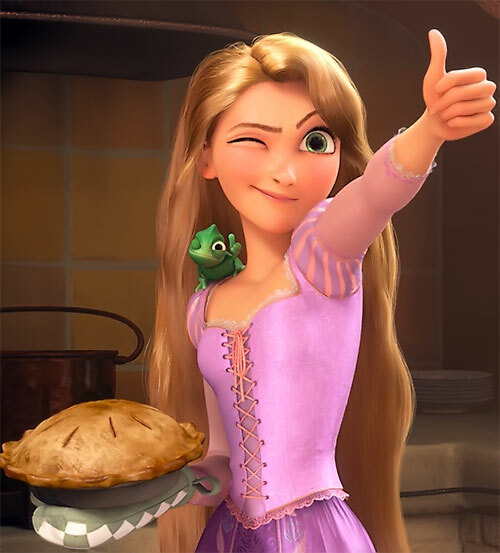 Rapunzel’s favorite soup is hazelnut. 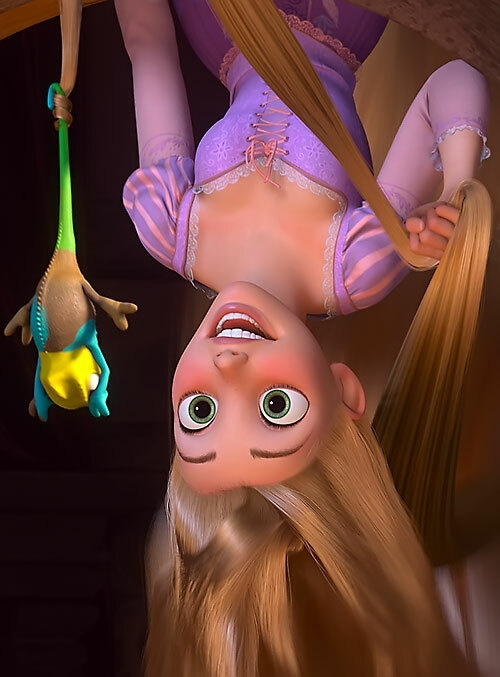 Rapunzel could be the child of the inhuman Medusa, her background would have to be changed and her powers wouldn’t be magical in nature but derived from her heritage. Damage Transference, User does not suffer any risk of Injury (+3). Damage Transference Range is Touch (-1). Damage Transference is contingent on Flash (-1). Flash is steady illumination for as long as any portion of the healing song is sung and about 20 seconds aferwards (-1). Snare has Swingline bonus (+1). Spiritual Drain has a range of Touch (-1). Spiritual Drain is contingent on Flash (-1). Spiritual Drain has the Age Reducing Bonus (+2). Spiritual Drain may only be used to reduce the age of the target, but only up to 50% (-1). Spiritual Drain is not permanent but lasts for one day instead of a number of rounds equal to RAPs earned, then gradually fades back to the true age of the recipient. (Base Cost: increased to 30) (+1). 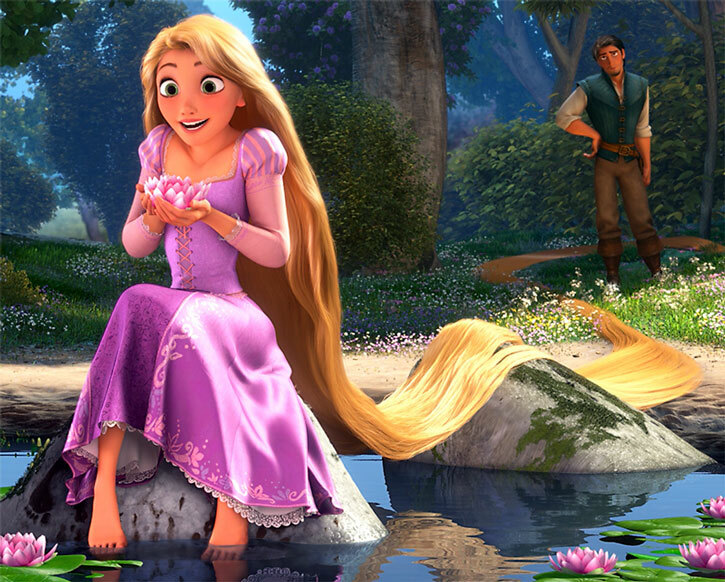 If Rapunzel’s hair is cut, the age reduction is lost immediately. Stretching doesn’t allow fine manipulation (-2) and has the Grappling Bonus (+1). Headquarters (Confined, of course), Pet (Pascal). Eugene “Flynn Rider” Fitz Herbert (High). 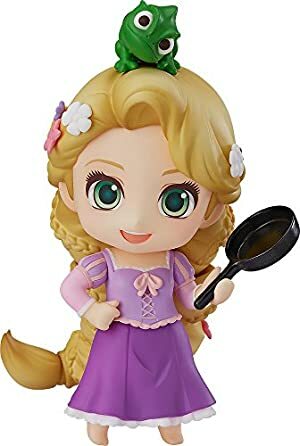 Innocent, Minor Irrational Attraction to Eugene Fitz Herbert, Power Loss: If Rapunzel’s hair is cut all powers drop to 00APs, her hair turns brown (its true color). This is a permanent loss. Cast-Iron Frying Pan [BODY 06, EV 05, Cost: 25]. This pan is an incredibly efficient weapon, hitting harder than most swords. Shrinking is always on (-1). 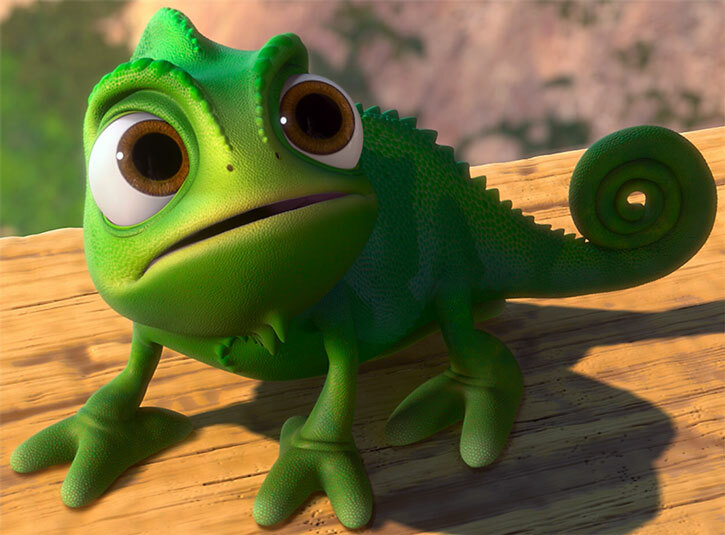 Color may only be used to change Pascal’s skin color (-1). Color may not be used to make Pascal’s skin transparent. Military science (Camouflage) is Contingent Upon Color. Miscellaneous: Pascal cannot speak, only squeak, though he’s still a good communicator. 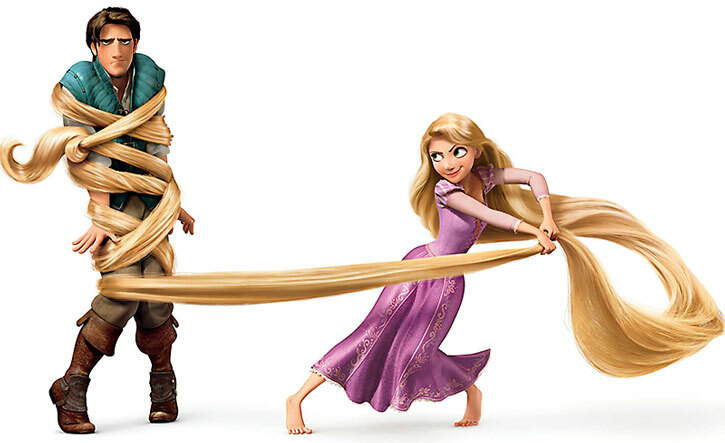 Rapunzel acquires Financial Backer (Billionaire) at the end of the film. But at that point the story is concluded. I struggled with the idea of giving Rapunzel Charisma. It kind of doesn’t make sense with her being trapped in a tower her whole life with only her mother as human interaction. However, she convinces Flynn to take her from the tower, then at the Snuggly Duckling she saves Flynn from all those thugs. Then there’s the scene with Maximus where she stops him from attacking Flynn. Her Persuasive ability however has no effect on her mother who has a very strong personality herself. Mother Gothel used the flower for centuries to stay young, then used Rapunzel for 18 more years after that. Ok, so how many APs does Rapunzel need to reverse Mother Gothel’s age, what? 30 years or so? I looked up Time Control and the text of that power sent me to Spiritual Drain for the reverse Aging Effect. According to Spirit Drain, after RAPs are calculated those RAPs are translated as a percentage of the victims age. So, she really doesn’t need a lot enough to do say 03 RAPs or so to Mother Gothel’s spirit which is probably around 05-06. Reducing her by about 50% of her age. 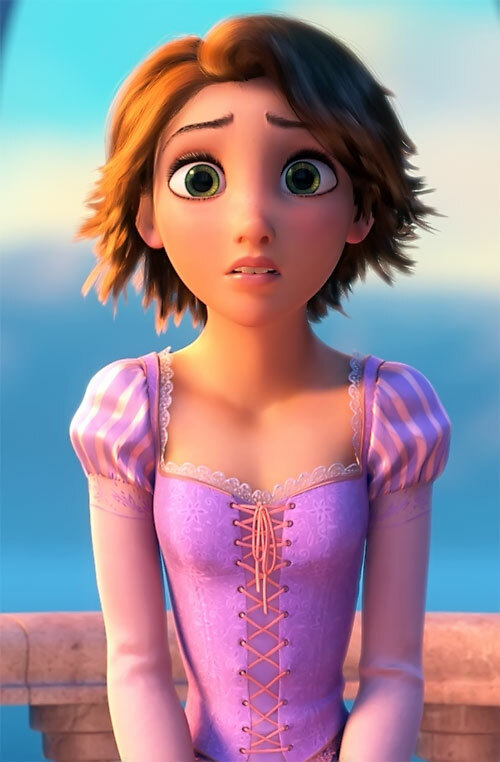 Source of Character: Disney’s 2010 animate film Tangled, Character voiced by Mandy Moore (Delaney Rose Stein voiced Rapunzel as a child.). Helper(s): Animals File Iguana writeup from W.org., Adam, Azrael, William Chamberlin, Sébastien Andrivet. Writeup completed on the 3rd of November, 2011.